We see it all the time, light gauge doors develop cracks quick. Call us right away! The door can normally be saved for much less than you might think! Does your garage door sag and pop upon opening and closing the door? Don’t spend unnecessary money on do-it-yourself fixes; instead give us a call right away! Garage doors are made of several different types of materials and come in several different shapes and sizes. Fixing a crack in a garage door can be a time consuming, expensive, complicated and even impossible task. Metal and Vinyl doors can potentially be welded, but with lighter gauge metals, it is almost never going to be a permanent weld repair. There are, however, some options when it comes to keeping your garage door in working order. The first option would be to install metal struts. A strut attaches to the inside of the garage door, running the full length of the door. The replacement of a strut will not fix a crack, but it will allow for reinforcement to prevent further cracking, thus allowing the door to function safely. However, the addition of struts will affect the door weight, requiring the replacement of the door springs to accommodate the heavier load. If the cracks in the door are too severe, there are other options. By locating the model number and manufacturer of the original garage door, you may be able to order replacement parts, including a new panel. There should be a sticker located on the inside of the garage door or the panel sides with the aforementioned reference materials on it. However, often, even trained technicians cannot locate the manufacturer and model numbers. This makes it almost impossible to find the correct panel to fit the door. It is much easier to find and replace a panel for a wooden door as opposed to a metal door, if and only if, the panel is available. 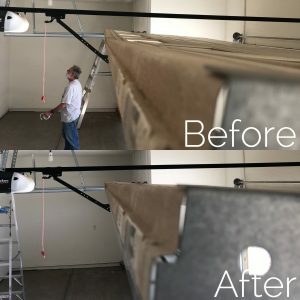 All in all, it is usually less hassle and equally as cost effective to replace the entire garage door rather than to try and piece parts back together. Also, it is much less frustrating than trying to go through the process of replacing the struts, replacing the springs, feverishly trying to locate a sticker that may not be viable and then ultimately self-welding on a panel that may not hold due to the gauge of the material. Therefore, it is of standard opinion that while it may be possible to fix a crack in a garage door, it is not easy, cost-effective, or timely. 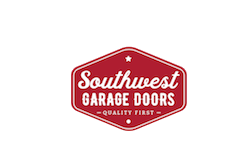 Call Southwest Garage Door today to address your cracked, damaged door! Do not let your husband or handyman go to Home Depot and attach random objects to the door to try to fix it. This may fix it for a short period of time and can actually make the problem worse. If caught early enough it’s a pretty inexpensive fix and needs a 8ft-18ft long Reinforcement brace called a Strut. Cracks will normally occur on the second panel from the ground or the top panel were the electronic motor attaches to the door to open and close the door. This also applies if your planning on installing a motor on the small door in your three car garage. The top of the door will need a Strut to support the pulling pressure of the motor to keep it from folding in half like a taco! If your garage door buckles you’ll be hearing a loud bang half way through the cycle of the door opening and closing. This is caused by the door not being supported across the center of the door. The 2nd or 3rd panel will start to sag over time because the steel softens up and needs a Reinforcement that runs the width of the door. Same situation as up above, a steel Strut 8ft-18ft will be placed across the door to reinforce the buckling panel.